There are many ways that people can lose their hair. At RHRLI, we often deal with androgenetic alopecia, better known as male or female pattern hair loss. It’s a condition that is related to a hormone called dihydrotestosterone (DHT). DHT causes hair follicles to shrink, resulting in a pattern of hair loss. There are other medical conditions that cause hair loss, but not every cause of hair loss is medical. There is a condition that can lead you to lose hair in bunches that’s psychological. It’s called trichotillomania and it often requires help from both medical and mental health professionals. At RHRLI, we’re hair loss experts and we want you to know the facts about any condition that can affect you. And if you’re looking for a permanent solution to hair loss or thinning hair, RHRLI can help. We’re the only hair loss treatment center on Long Island that offers the ARTAS® System, cutting edge robotic hair transplant technology that will leave you with a fuller, healthier head of hair. Trichotillomania is a condition in which patients have an irresistible urge to pull out their hair, according to WebMD. It’s considered an impulse control disorder and patients usually pull hair from their scalp, eyelashes, and eyebrows. This is more than just an occasional habit. Patients know that pulling their hair out is damaging, but they are unable to stop doing it. For some patients, pulling hair out is a way to relieve stress and they do it to soothe themselves. Some of those afflicted by the condition, say the urge to pull hair out starts with a feeling in the scalp or skin that feels like an itch or tingle, according to the website kidshealth. They tug at hair as a way to get relief from the sensation. The result is that there are patches of hair loss on the scalp or eyebrows. In extreme cases, patients can become infected, damage skin and even have permanent hair loss. People with trichotillomania often feel embarrassed or depressed about the condition. Many hide the condition and don’t seek help. Nobody knows the cause of trichotillomania, but there is some thought that it could be related to abnormalities in brain pathways that link to areas having to do with emotional regulation, according to WebMD. Treatment for trichotillomania usually involves behavioral therapy called habit reversal training. Patients learn to identify when they have the urge to pull hair out. They are also taught relaxation techniques and alternatives to pulling hair, for example, making a fist instead. Sometimes, medication is prescribed as a treatment for trichotillomania. An antidepressant called a selective serotonin reuptake inhibitor has been known to be helpful to curb the urge to pull hair, according to WebMD. In some cases, antipsychotics like olanzapine or aripiprazole may be prescribed. 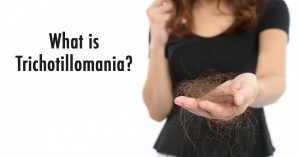 If you feel that you may have trichotillomania, you should consult your doctor or a mental health professional immediately. If you’re looking for a permanent solution to hair loss RHRLI can help. The ARTAS® System is a non-invasive hair transplant procedure that uses robotic technology to identify the healthiest donor hairs and transfer them with precision. It will leave you with a healthy, natural-looking head of hair. For more information, contact RHRLI.